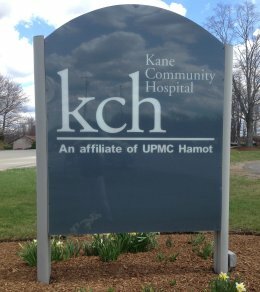 Kane Community Hospital on 4372 Route 6 in Kane, Pennsylvania has been providing personal, professional, and progressive health care to residents and guests of the Alleghenies for over 70 years. This UPMC Hamot affiliate is a 31-bed acute care rural hospital licensed by the Commonwealth of Pennsylvania. KCH’s active and consulting medical staff and services provide a broad base of primary care and specialties including: cardiology, community wellness, emergency medicine, family medicine, gynecology, home health care, internal medicine, occupational medicine, urology, oncology/outpatient chemotherapy, ophthalmology, orthopedics, pain medicine, pathology, pediatric medicine, radiology, rehabilitation services and surgery.